"What kind of moron stops at roadside attractions when we're on the run?" "I just want everyone to have a good time." 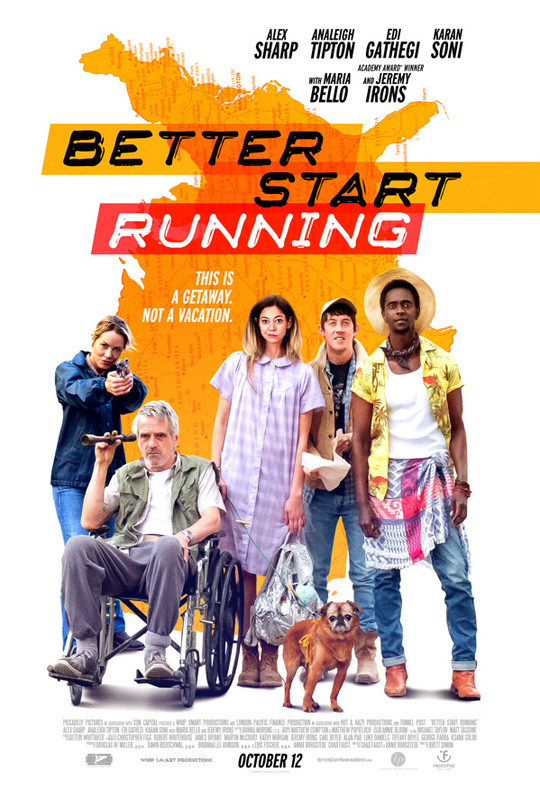 Freestyle Releasing has debuted an official trailer for an indie crime comedy titled Better Start Running, which premiered at the Newport Beach Film Festival this year. This is the latest film from director Brett Simon, who made one of my favorite underrated indie films - Assassination of a High School President in 2008 (read my original review here). Better Start Running is about an ordinary store clerk and a group of misfits who end up on the run driving around without anywhere to go. Alex Sharp stars, with Analeigh Tipton, Jeremy Irons, Edi Gathegi, plus Maria Bello and Karan Soni. This looks totally awkward and not that original. Could be good, could be bad, the footage isn't great. Maybe the film is better. In Better Start Running, an eclectic band of misfits becomes an unlikely family as they take a wild journey in the name of love while on the run from an overzealous FBI duo who wants to capture them dead or alive - preferably dead. Better Start Running is directed by American filmmaker Brett Simon, of only one other film, Assassination of a High School President in 2008, previously. The screenplay is written by Chad Faust and Annie Burgstede. This first premiered at the Newport Beach Film Festival earlier this spring, but not at many other fests. Freestyle Releasing will release Simon's Better Start Running in select theaters + on VOD starting October 12th coming up. For updates follow @BSRmovie. First impression? Anyone interested?